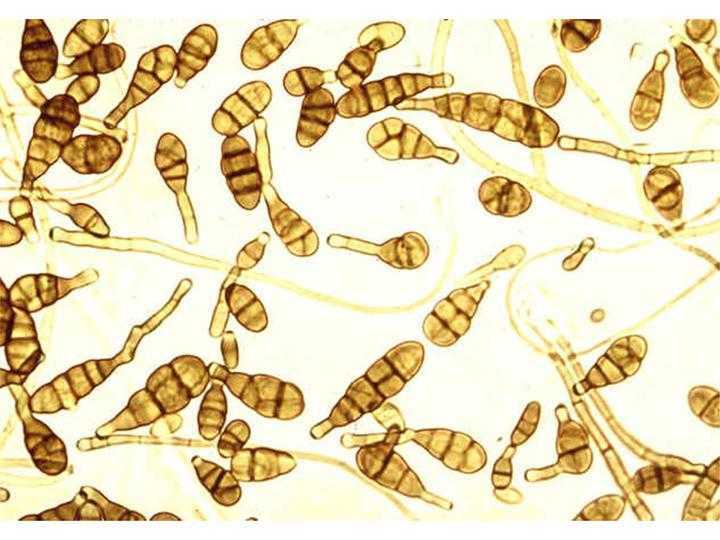 Specimens of Alternaria are often found growing on carpets, textiles and horizontal surfaces such as window frames. It is commonly found in soil, seeds and plants. It is known to be a common allergen. It appears as a velvety tuft with long soft hairs and its color ranges from dark olive green to brown. Alternaria is a dry spore and is readily found in air samples as well as on tape lift samples. Alternaria is commonly found in water damaged buildings, and a significant increase in its numbers compared to outdoor levels can be a sign of growth. Alternaria has been associated in some cases of hypersensitivity Pneumonitis. Often found in carpets, textiles, and on horizontal surfaces (often on window frames) and building interiors. Also, it has been often discovered in damp places, basements, soil, seed, and plants. Outdoors, it may be isolated from samples of soil, seeds and plants. Alternaria has been shown to be related to bakers asthma. It has been associated with hypersensitivity pneumonitis and is a common cause of extrinsic asthma (immediate-type hypersensitivity: type 1). Alternaria has a unique group of mycotoxins, including alternariols, altenuenes, altertoxins, tenuazonic acid, and AAL toxins. Alternariols and altenuenes are weakly toxic to mice and are cytotoxic (toxic to cultured human cell lines) in vitro at concentrations between 6 and 28 ug/ml (15). Altertoxins and the related compound stemphyltoxin-III, also produced by Alternaria, are mutagenic. Tenuazonic acid (Chemical name: 2H-Pyrrol-2-one, 3-acetyl-1,5-dihydro-4-hydroxy-5-(1-methylpropyl)-, (S-(R*,R*))-) appears to inhibit protein synthesis by preventing newly formed protein molecules from detaching from the ribosomes on which they formed. It is lethally toxic to young birds, and in administration to animals produced effects such as “salivation, emesis (vomiting), anorexia (avoidance of eating), erythema (red skin flush), gastrointestinal haemorrhage, convulsions, increase in packed cell volume (an immune parameter) and many other effects” (15). AAL toxins appear to have limited toxic effects against some cultured mammalian cell lines, but are mainly of significance in invasions of plants by Alternaria phytopathogens. Acute symptoms include edema and bronchi spasms, chronic cases may develop pulmonary emphysema. As with other toxigenic molds, alternaria can also alter DNA, as well as destroy the human immune system. Conidia dimensions is about 18-83 x 7-18. Large spore size 20-200 x 7-18 suggest that the spores from this fungi will be deposited in the nose, mouth, gut, and upper respiratory tract. Alternaria radicina, A. carotiincultae, and A. petroselini are closely related pathogens of umbelliferous crops. Relationships among these fungi were determined based on growth rate, spore morphology, cultural characteristics, toxin production, and host range. Random amplified polymorphic DNA (RAPD) analysis of these species, other species of Alternaria, and closely related fungi was also performed. A. petroselini was readily differentiated from A. radicina and A. carotiincultae on the basis of spore morphology, production of microsclerotia, host range, and RAPD analysis. Alternaria radicina and A. carotiincultae were considerably more similar to each other than to A. petroselini, but could be differentiated on the basis of growth rate, spore morphology, colony morphology, and, to a limited extent, RAPD analysis. When grown on media having a high nutritional content, A. radicina produced a diffusible yellow pigment and crystals of the fungal metabolite radicinin. In contrast, A. carotiincultae produced little or no radicinin. However, when A. carotincultae was grown on the same medium amended with radicinin, growth rate and colony and conidial morphology were more similar to those of A. radicina. These results suggest that the morphological differences between A. radicina and A. carotincultae are due, at least in part, to radicinin production, and that these fungi are conspecific. Therefore, we propose that A. carotincultae be considered a synonym of A. radicina.